Simply Scrumptous had sent me some samples from their line of Fit & Flavorful Fat Free products. 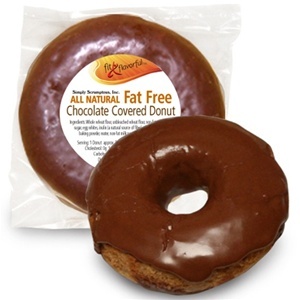 I have reviewed some of their other products they sent me already, but 2 of my favorites that I was sent are the Fat Free Chocolate Covered Donut and Fat Free Mom’s Apple Pie Muffin. For more information about nutrition and ingredients, you can click here! donut, fat free, fat free chocolate covered donut, fat free mom's apple pie muffin, Fit & Flavorful, muffin, simply scrumptous inc. 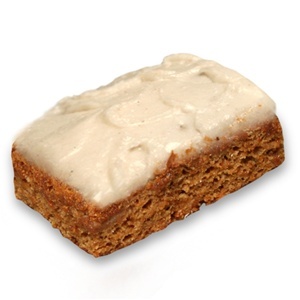 Along with the cookies and cupcakes, Simply Scrumptous also offers a fat free carrot cake. Don’t let the words “fat free” scare you off- everything from the Fit & Flavorful line of SImply Scrumptous’ products is fat free- yet still bursting with flavor! So, Simply Scrumptous sent me a few of their carrot cakes to try. Each one is actually decently sized, about the size of a pack of gum in length, but about 2-3 packs of gum in width.There is also a layer of icing on top, which wasn’t as hard as the icing layer on the cupcakes, but delicious none-the-less, and had a sweet vanilla flavor. The cake itself is very moist and dense, which strong carrot flavors. There are actual carrot pieces that you bite into. Which, on one hand, makes me feel healthy (hey! I’m eating veggies with my dessert! ), but I think I woud have also preferred the carrots to be a bit smaller in size, or pureed a little more for a smoother texture. I have already reviewed some products by Simply Scrumptous from their Fit & Flavorful line, and I really enjoyed them. So, I was not hesistant at all to try their cupcakes, which is also part of their Fit & Flavorful Line of products. First off-let’s start by asking when is the last time you ate a cupcake (with icing!) and didn’t feel a ton of guilt after? Hmm, was that maybe when you were in elementary school and they brought in cupcakes for one of the kids birthday? You never thought twice about the calories or the sugar in each of those sweet, delicious cupcakes. Well- I’m here to bring back some of those good feelings! Seriously- the cupcakes that Simply Scrumptous makes are really quite good. 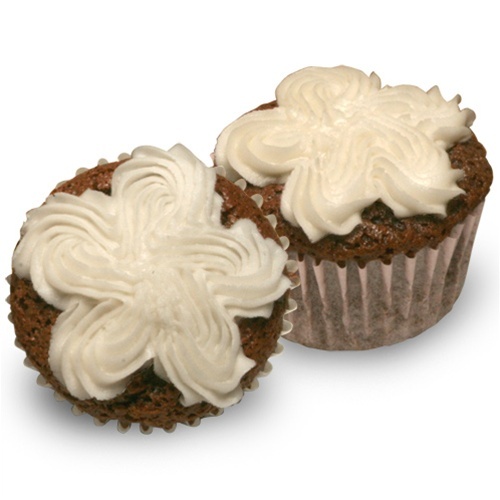 It is a chocolate cupcake with a thick layer of icing on top, designed in a cute flowery arrangement. It was kind of small, only 2.1 ounces, but I cut it in half and ate both “halves” which made it more satisfying. It was also the perfect compliment to my sandwich & apple at lunch time when my sweet tooth hit. The icing was very sweet, and had a vanilla flavor. It tasted like the frosting on Dunkin Donut’s donuts in my opinion. It was slightly hardened, like when you ice a cake and let it sit overnight without any saran wrap on it-but I enjoyed that! You could also heat it in the microwave for 10ish seconds to melt it a bit. The cake part was very moist, with a strong cocoa flavor. It wasn’t as sweet as the icing, but still very delicious. I would eat it on it’s own. Eaten together– it was fantastic! The sweetness of the icing paired nicely with the cocoa and mellow sweetness of the cake. I have a sweet tooth, so the icing was really a nice touch for the cupcake. I’m giving the cupcake 4 1/2 stars. low in calories, high fiber, all natural- You can buy some now! Also, get 35% off your first order using the code HNXO! Simply Scrumptous (yes, spelled without the “i”), makes delicious, gourmet cookies & brownies. They use only all natural ingredients, with not a single preservative or additive. They make giant cookie cakes, muffins, brownies & cookies, all with a rich and truly decadent taste. They also have a Fit & Flavorful line for those of us who don’t have any extra wiggle room in our diets for sweets, or for those of us who are just health conscious. The Fit & Flavorful line provides fat free (yes, FAT FREE!) cookies, cupcakes, muffins, donuts, and carrot cake. They are all natural, low calorie and individually wrapped (yay portion control!). Super Snickerdoodle- wow. Literally in love when I bit this cookie. It’s SUPER soft and almost has that fresh baked gooey/yummy consistency in the center. It’s also covered in cinnamon, and has a sweet cinnamon sugar taste, with just a hint of vanilla. I can’t believe it’s fat free- it’s soooo delicious!! This one gets 5 stars for taste. Double Fudge Chocolate- this one has a strong cocoa powder taste rather than a “Hershey bar” chocolate taste. It’s still very good- and I don’t think it’s as sweet as the other ones. It does remind me of eating fudge- just not as dense. It was really good with some peanut butter smeared on it. (But, when is PB& chocolate ever a bad combination?? 🙂 ) This one gets 4 stars for taste. Sensational Sugar- I tried 2 of these, and had 2 different experiences. One was okay and not that sweet, but soft, and the other was really good, sweeter, and harder/crispier. The sugar is my least favorite of the 4, I feel like it was missing something, and surprisingly, despite the name, wasn’t as sweet as the others. It was still a good cookie, but just needed a little more oomph. This one gets 3 1/2 stars for taste. 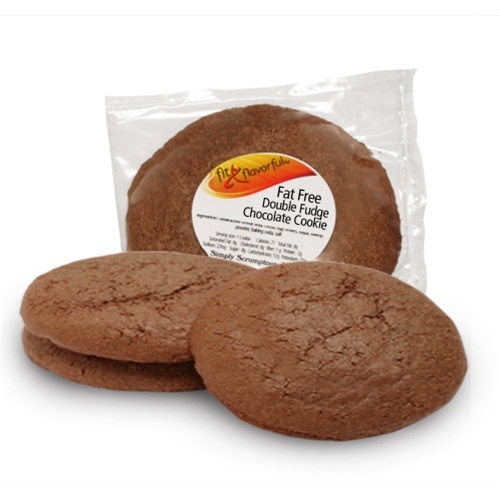 Simply Scrumptous- you make excellent, mouth watering cookies, all fat free and under 100 calories. (Can you please make a PEANUT BUTTER flavor!?! 😀 😀 😀 ) The only thing keeping me from eating this ALL DAY LONG (and I’ve already had the sugar one with my breakfast, the snickerdoodle flavor for a snack…) is that they are made with Unbleached Flour, and use refined sugar. If they were whole wheat- or even partially whole wheat- and used a less refined sugar like molasses or honey, these cookies would be 5 stars for sure! I do think that using refined sugar might play into the awesome texture of the cookies, as sugar often alters the consistency of baked goods a lot. However, taking nutrition, taste and calorie count into effect, I’m giving them an overall rating of 4 stars. They really are yummy and decently sized. Perfect swap for your standard cookies anyday. Check them out here! Also, get 35% off your first order using the code HNXO!